Randy is a lifelong Yukon native. 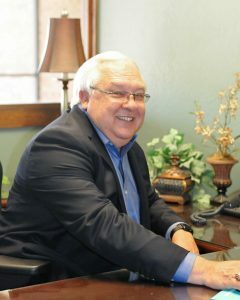 His family has owned and operated the bank since its founding in 1912. He graduated from Oklahoma State University with a Bachelors degree in Business Administration in 1981. Randy was also a star basketball player at Oklahoma State University during his time there. Randy wasted no time after his college graduation and started working at YNB in 1982. He worked in a variety of lending and executive roles at the bank before taking over as President and CEO in 2000. Randy currently serves as the President, CEO and Chairman of the Board of Directors. Randy is proud of his Yukon heritage and believes YNB has an integral place in Yukon’s history. Randy has a broad commitment to the community and ensures that YNB sponsors countless community events that are enjoyed by thousands of Canadian County residents every year. As a family-owned and operated business for over a century, it’s no surprise that banking runs in the family. Randy has one son and three daughters. His oldest daughter, Katrina, a Vice President and Human Resources Officer at YNB, currently serves on the Board of Directors’ Advisory Board. Randy’s banking experience spans nearly four decades. With experience in every type of lending, Randy enjoys helping his customers secure the financing they need. Schedule an appointment to discuss your financing needs today! Copyright © 2018 YNB. All rights reserved.